The policy was launched by the Inspector General of Police John Martins Okoth-Ochola. 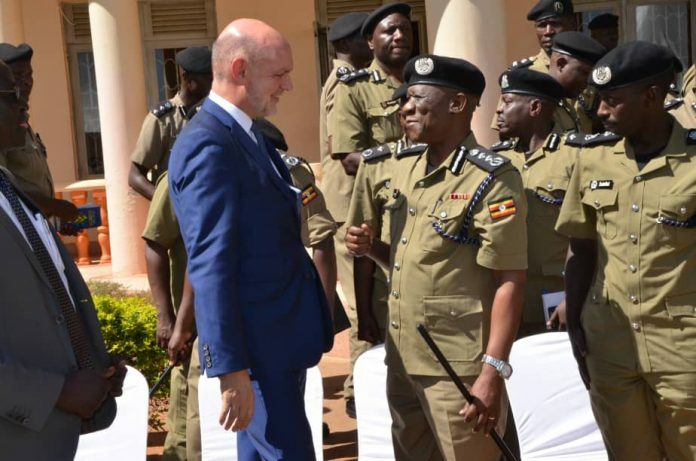 “The policy is aimed at promoting a democratic, accountable and human rights sensitive policing in Uganda, police officers must comply with the duty and obligation to observe the human rights of people being policed.” said the IGP in his opening remarks. officers should act with fairness, self-control, tolerance and impartiality when carrying out their duties, acting with integrity towards members of the public and their colleagues so that confidence in the police is secured and maintained. “Avoid all forms of behaviour that may reasonably be perceived to be abusive harassment, bullying and victimization” added the IGP. The British High Commissioner, Peter West, who graced the function also commended the policy as a great milestone towards increasing confidence of foreign investors. Mr Ochola asked police officers to observe human rights in the implementation of their duties. He added that whatever the situation may look like, officers must endeavor to continuously strengthen and promote respect for human rights in the Uganda Police Force. This is the first-ever human rights policy in the force. Various stakeholders including British High Commission and Human Right Network (HURINET) played a bigger role in the financial and moral support in the formulation of the policy. The policy is premised in the principles of performance of duties whereby an officer should respect and protect human dignity, maintain and uphold the human rights of all persons. The officers should act with fairness, self-control, tolerance and impartiality when carrying out their duties. Still, officers are expected to act with integrity towards members of the public and their colleagues so that confidence in the police is secured and maintained. The IGP said all forms of behaviors that may reasonably be perceived to be abuse, harassment, bully or victimization should be avoided.